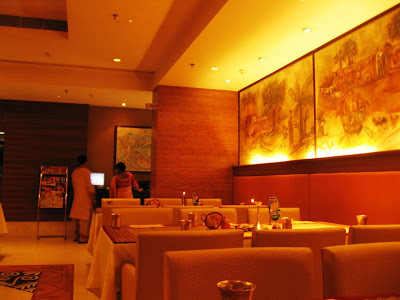 For a taste of authentic Bengali food in Kolkata there is no better place than Aaheli. Located in the historic Esplanade area within Peerless Inn, this restaurant serves up elaborate local cuisine in a traditional setting. 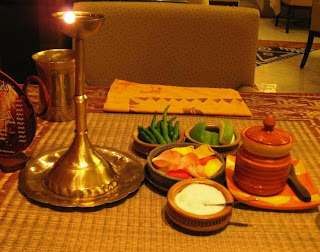 Local paintings adorn the wall and brass oil lamps on tables enhances its unique Bengali experience. 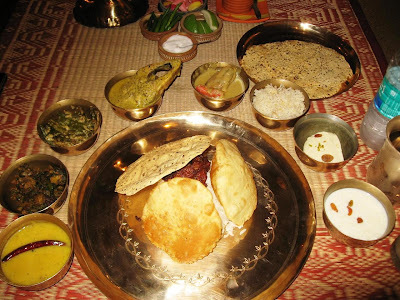 Traditional Bengali food consists of multiple courses with a clearly defined order in which these are eaten. As a person who spent most of his childhood outside Bengal, I remember being chided by my aunts when I offended their sensibilities by ignoring these 'rules'. While all courses are served together in bowls around the plate, one is expected to know which one to start with and which one comes next. This elaborate ritual is still the norm in many homes in this city steeped in history. A Bengali meal always demands leisurely attention. The secret to relishing it lies in lingering over every course and letting its layers of taste unfold. Steaming hot gobindobhog rice forms the center of every Bengali meal. Its richness springs from the variety: warm dal and fritters give way to the more complex notes of vegetables, finally culminating in the spicy magic of fish and meat. 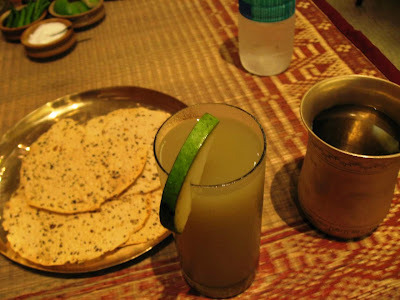 I began with the Aam Pora Sharbat, a tangy drink made of raw mango and seasoned with mustard seeds. When they brought the large brass plate of rice and pooris and explained the contents of the many bowls surrounding it, I was reminded of my many elaborate meals during summer vacations in Bengal during school days. Those days, the journey from Mysore to Kolkata took an entire three days by train. I still remember the verdant green surroundings, lotus-decked ponds, tube-wells in the bathrooms, varieties of fish for lunch and dinner, and of course sweets of all shapes and sizes. Not much has changed! The bhaja-moogh'er dal is a distinctly Bengali twist to the popular Indian lentil dish. The lentils are lightly roasted before being cooked and tempered giving it an unique taste. You eat the dal with some rice and the fritters. The chorchodi, a medley of leafy vegetables cooked with eggplant and whole spices in mustard oil is a favorite of mine. This simple dish was excellent and I polished it off in an instant. The sorse dharosh, okra cooked in a paste of mustard was good too, but not terribly exciting. 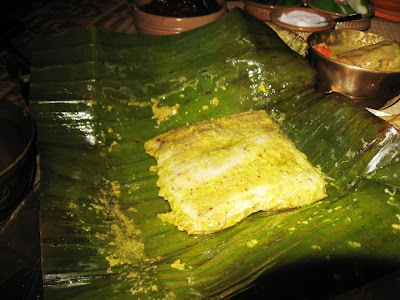 The bhetki paturi, fish wrapped in banana leaf and steamed with spices and mustard paste was tonight's stand-out dish. It was brought sizzling to my table, and the heady aroma of mustard and the freshness of the fish was nothing short of delicious. The Ilish bhapa is fresh-water Hilsa fish - from the famed waters of the River Padma in Bangladesh - steamed with a coating of yogurt and spices. The fish was fresh, as tasty as ever and amazing. Of course, if you aren't Bengali you may have some trouble with the numerous thin bones that make eating this fish as troublesome - and as fulfilling - as eating crab. The chingdi mach'er malaikari was next. Another common delicacy, this dish is made of jumbo prawns in a very delicately spiced gravy of coconut milk. The preparation here was good too, but not particularly outstanding; actually, I think I like the one at Oh! Calcutta better. There was a portion of ghee bhat and pooris accompanying these dishes. Ghee bhat is the Bengali version of pulao, with rice tossed in home-made ghee, raisins and cashews before being steamed. Finally, the desserts. A traditional Bengali sandesh followed by payesh. Payesh is the Bengali name for kheer or payasam. The best is made of notun gur or khejur gur, date palm jaggery that is harvested during the winter months. 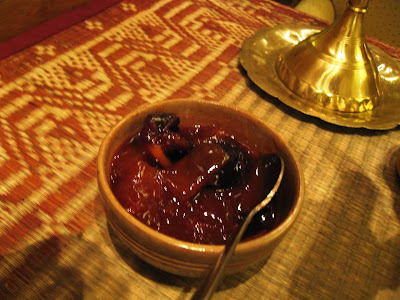 Along with everything else, I also enjoyed the aam khejur'er chutney, a thick sweet-sour chutney made of dried ripe mango and dates. All in all, a very satisfying meal. There were many more items on the menu I would have loved to explore. Exotic items include those made of thod and mocha, the stem and flowers of the banana tree and probably unique to Bengali cooking. 13 Parbon, 49C Purna Das Road in Golpark. Ph: 2463-2016. 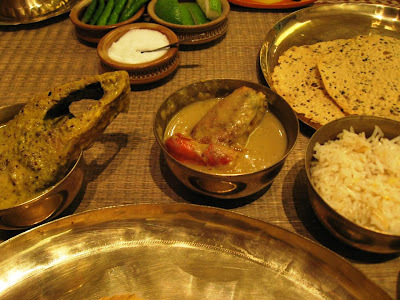 They serve age old Bengali cuisine in a refurbished way. Try their boneless Bhapa Ilish. 6 Ballygunje Place at that address in Ballygunje Phari, Ph: 2460-3922. Try their Daab Chingri. On my evening to Esplanade, the streets were crowded as only Kolkata can be: a teeming mass of people as far as the eye can see. The occasion: shopping for the coming Durga Pujas. Other than for this dinner in Aaheli, I didn't venture out into of the ITC Sonar much. 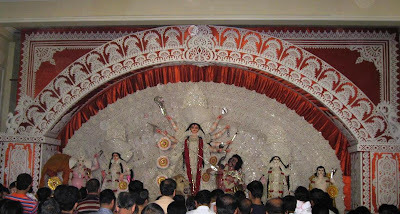 As I write this post, Durga Puja is being celebrated by Bengali everywhere. Durga Puja is to Hindu Bengalis what Christmas is to Christians and Ganesh Chaturthi to Hindu Maharashtrians. It is as much a cultural expression as it religious, celebrated with much pomp and splendor. Wish all my Bengali readers a very happy festive season! I have been a follower of this blog since someone passed me the link to your article about Biriyani, and I must say it's one of the best food blogs I have seen in terms of pictures, layout, description, language and passion for food! Being a fellow bong I am also naturally inclined towards food, and like to blog about the same (http://suhelbanerjee.blogspot.com/search/label/Food). My friends and family find the habit of mine of taking pictures, before, during and after meals particularly irritating, so wanted some tips about what to do in such situations! Also, being a keen carnivore, by the time I reach the 'meaty' portion of the meal I dig in with my hands and can't take further pictures of the dishes that follow, wanted to know how you manage to overcome this? This was intended to be an email, but since I didn't find an address on the blog I am leaving the comment. I have never experienced Bengali cuisine and after reading this post I feel like I am missing out on a great deal. Thank you for relating in great detail and depth the beauty of what Bengali food is all about. Your posts looks so elegant, sophisticated, so delicate and delicious and this one was no exception. I've never had Bengali food so this is very exotic to a Norwegian! Thanks for sharing: Interesting read and great pics to present the food. Oh such a delicate and delicious arrangement. Happy Durga Puja to you Shantanu! The food is so colorful! Makes me hungry... I haven't had Indian in a while. Blogtrotter is waiting for you at Old Town Antalya in Turkey. Enjoy and have a glorious weekend! I am sure calcutta must be very vibrant.. This, especially the bhetki paturi fish wrapped and steamed in leaf, reminds me of some of the delicious local cuisine I tried out in Ernakulum last month. 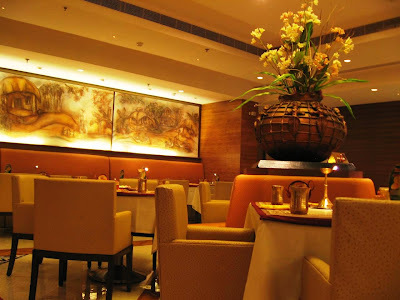 Excellent Review... Aaheli is one of the finest bengali restaurant in Calcutta. This Durga Puja, i was back home in South Calcutta and like every year i savoured Calcutta's diverse food-culture. try their "Palong Chhaanar Kofta", "Gotamoshla Maangsho", "Chitol Maachher Muittha" and "Smoked Hilsa"
u just cant miss their "Sabujdeeper Kankra" (a crab dish), "Chingri maachh diye Mochhar Ghonto", "Ilish Kalo Jeere jhhal", "Mourala Maachher Jhaal", "Boal Maachher Tel Jhaal", "Tel Maagur Maachh"..
my favorite restaurant to have bengali food.. they make magnificent "Bhetki Madhuri" (a dish prepared with riverine bheckty fish), "Tel Koi", "Ilish Barishali", "Aar Maachher Dopyaza", "Chitol Maachher Peti" and their signature "Mutton Dakbangla" & "Chicken Goalondo"
@Lakshmi: Oh yes, Kolkata before the Pujas is at its festive best! @Suhel: Re: food pics, heh! Common problem. Sometimes have to come back alone to do justice to the pictures. Thank you for your comments. 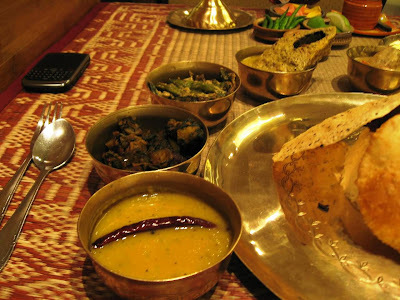 @Meg: Bengali cuisine needs to be tasted by those who only known the usual North and South foods of India. @Renny, @Final Transit, @Zhu, @GMG: Thank you! @Uttiya: Thank you for sharing all the other places here. You got me hungry with that spread and all that food talk. I have never lived in Calcutta and I so miss it all of a sudden - especially for the food. What do you think of Kewpie's? @preeOccupied: Thank you! I haven't tried Kewpie's yet myself, but hear good things.